The 2011 Word for Word Poetry season began last Tuesday, May 31st with a live broadcast of WFMU's Antique Photograph Music Program with MAC (a.k.a Michael Cumella), and will continue tonight at 7:00 pm with readings from poets Elaine Equi, Joseph Lease, and Chris Martin, co-hosted by Coffee House Press. 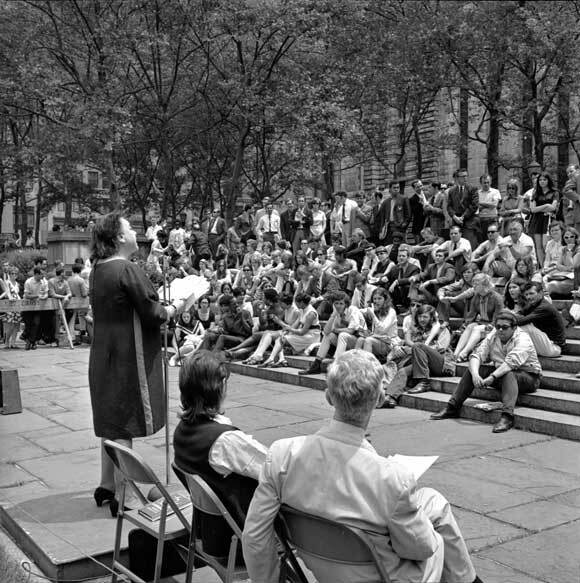 As far back as the 1960s, poetry readings were staged in parks throughout the city as part of the Academy of American Poets program Poets in the Parks. 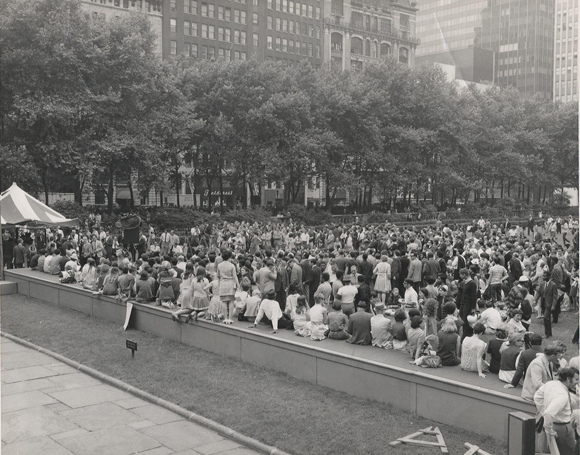 Not surprisingly, American modernist poet Marianne Moore drew a large crowd with her 1968 Bryant Park appearance. I don't know what works she read that day, but I like to imagine her poem "An Octopus" was one of them, with all of its incredible imagery and detail. And, I don't know what her voice sounded like, but I like to imagine it too, as full of body and authority as her words. Pulitzer Prize winning poet Ms. Marianne Moore at the podium. 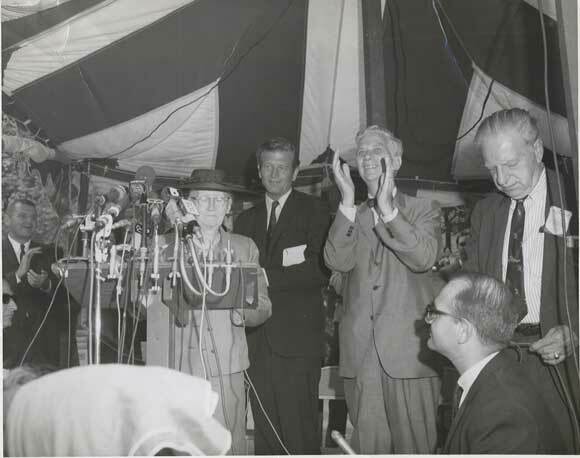 Behind her is NYC Mayor John V. Linsday, and Mr. August Heckscher, Administrtor of Parks, Recreation and Cultural Affairs. The following year, the poetry season started out with this reading. I don't recognize the poet, but if you do (or even better, if you were there) please email me. * 6/10/2011 update: Thanks to poet Mary Austin Speaker, for identifying activist and poet Muriel Rukeyser in the photo below. The park has a strong connection with poetry, starting with its namesake, American romantic poet and newspaper editor William Cullen Bryant, who is memorialized on the upper terrace with a bronze monument. In 1884 the park's name was changed from Reservoir Square to Bryant Park in his honor. According to some, he was the first American writer of verse to accomplish international fame. The blessing of supreme repose.